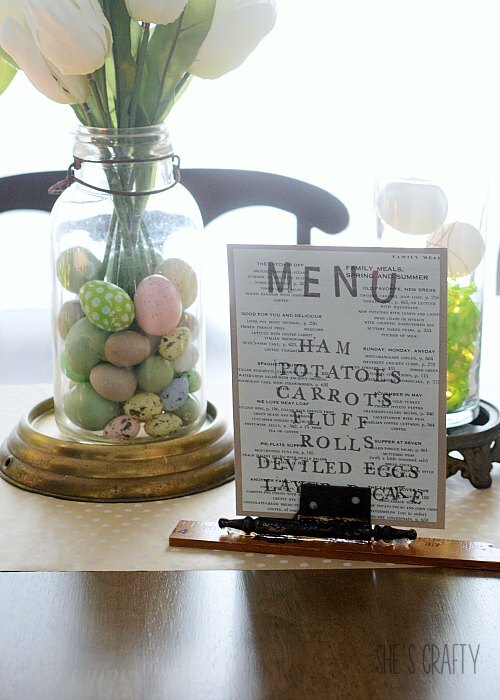 Do you have your Easter menu planned? We pretty much have the same thing year after year. I think my family would be disappointed if I didn't make all of the things they've become accustomed to! 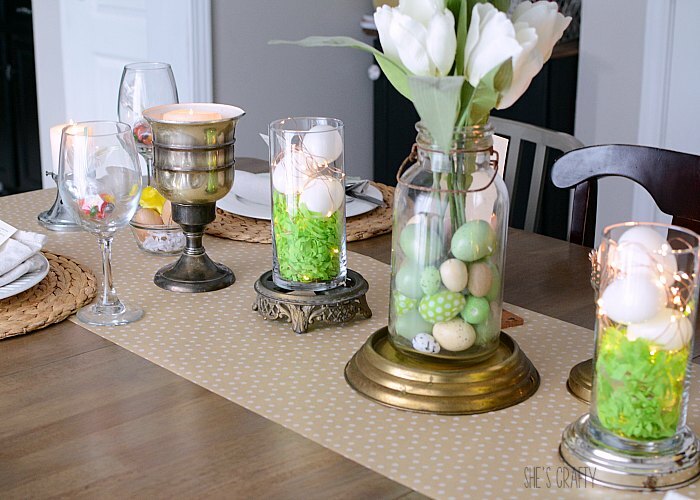 What does change every year is our Easter Table Setting. This year I used many vintage items and I'm in love with it! 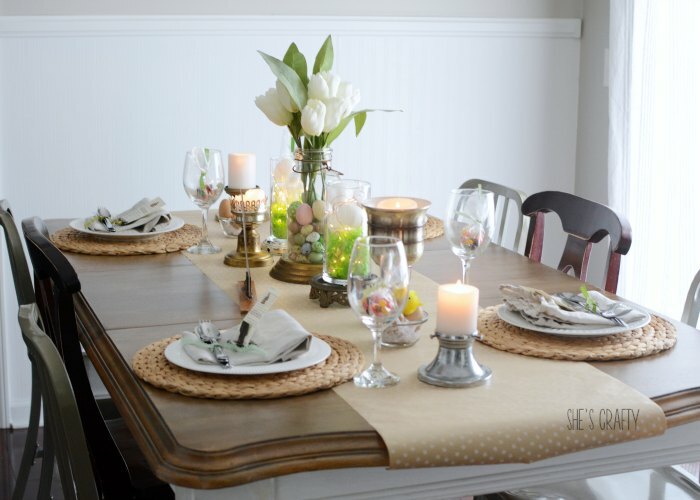 To decorate my Dining Room table, I started with a roll of kraft colored wrapping paper with white polka dots. Last time I was at the flea market, I picked up a bunch of random vintage metal goodness! 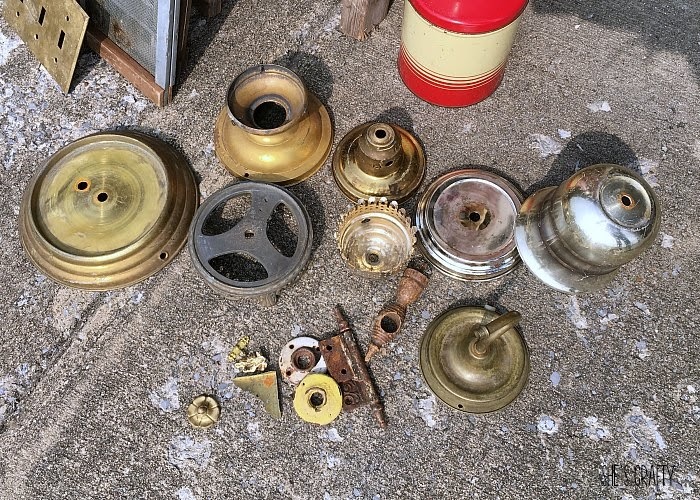 I think they were old lamp pieces and light fixtures. 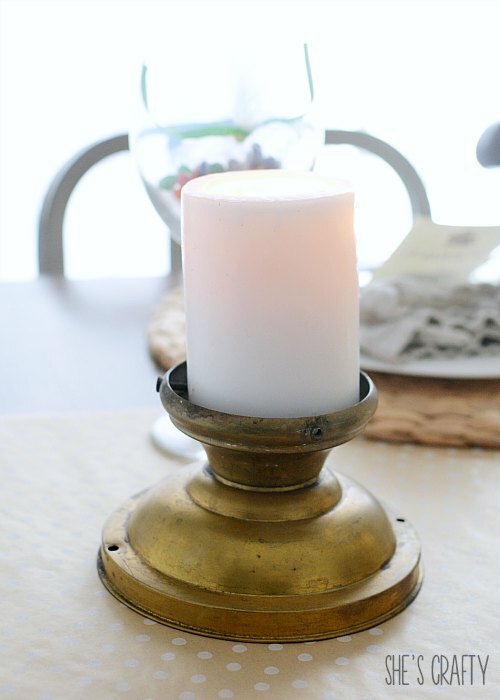 I used a few of them to make candle holders. I used hot glue to marry the pieces temporarily. I'll probably take them apart and use them for something else. If I wanted a permanent hold, I'd use E6000. 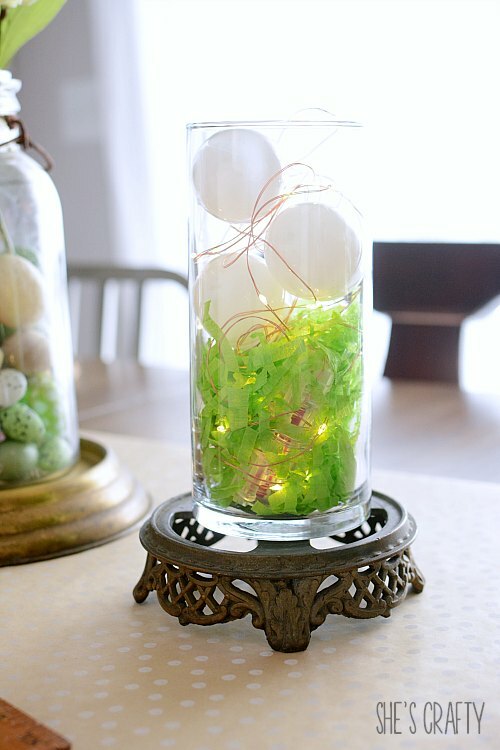 This piece from an old lamp makes a perfect stand for a jar of white eggs, green grass and fairy lights. 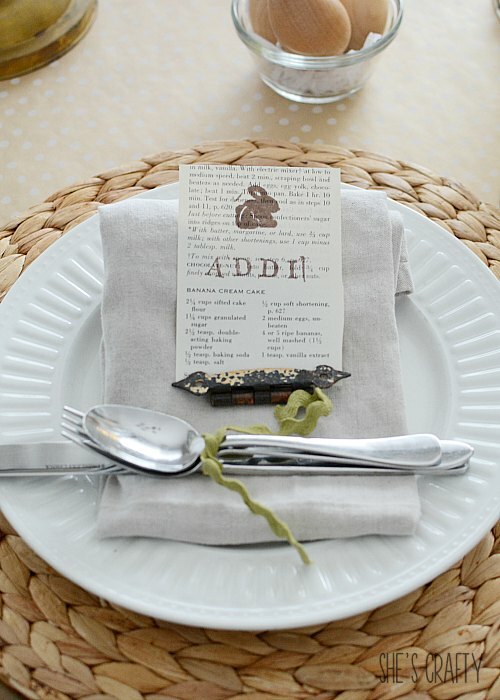 At each place setting I used a place card on a vintage hinge, a linen napkin, our silverware-tied with a ribbon, and our everyday white plates, on top of a wicker charger. spell out each name and a chocolate Easter bunny. 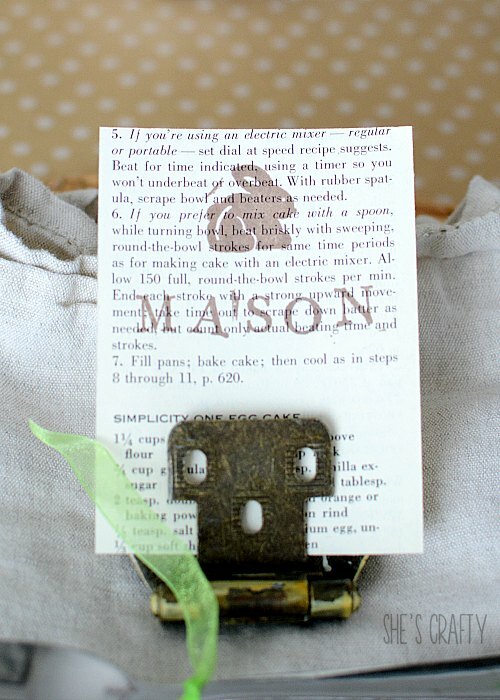 A vintage hinge is holding the placecard. 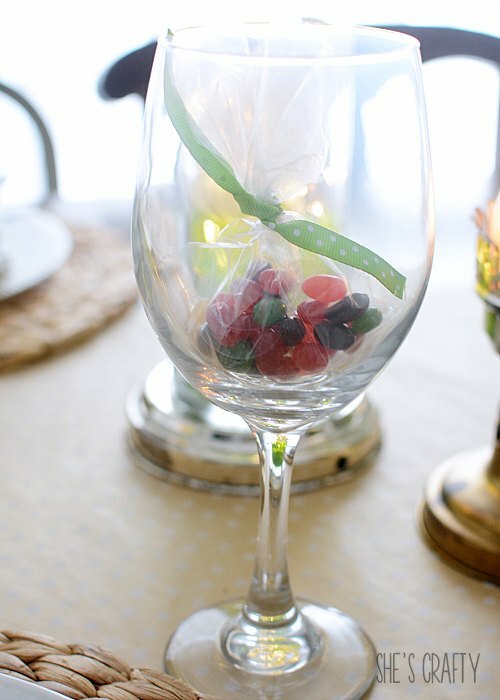 Each setting also has a stemmed glass with a little baggie of (the best) Starburst jelly beans. All of the different metals look so good mixed and matched together! I stamped our Easter Dinner menu on the same cookbook paper as the place cards. The menu holder is a large beat up hinge that is rusted closed. Luckily it's frozen with just enough room to stick a paper inside. I hot glued the hinge to the remnant of an old yardstick. 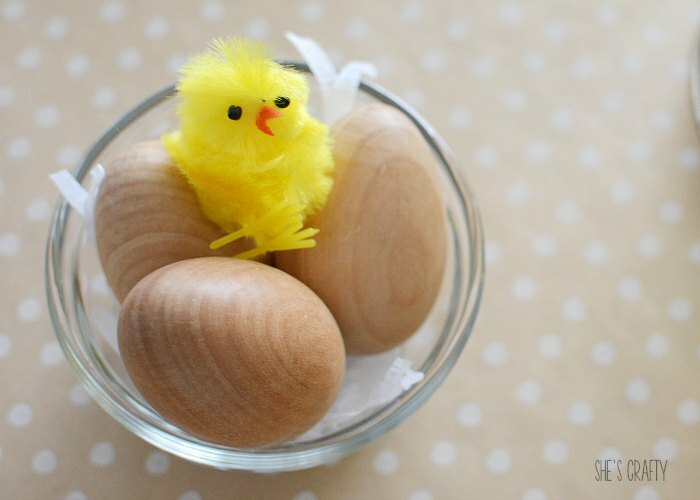 I just love the wooden eggs and the pom pom chickies!! 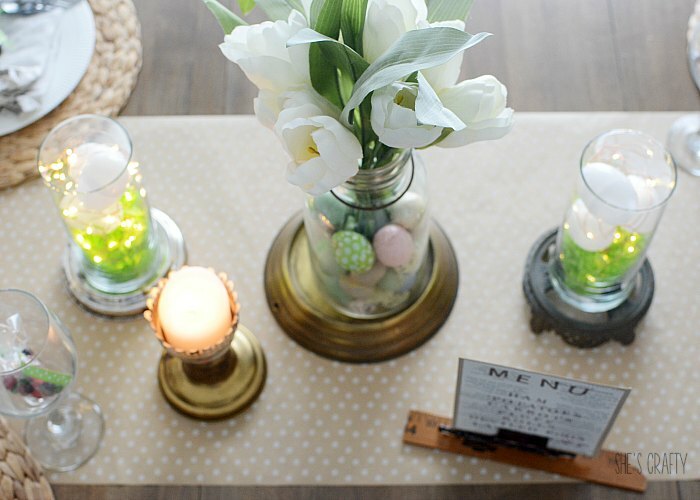 Such a charming addition to our Easter Table! Our shelving unit is right beside our table. 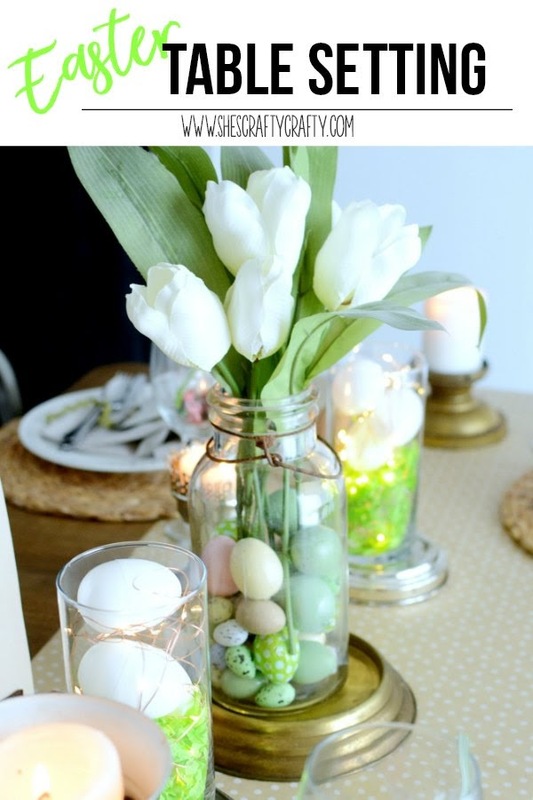 I couldn't help but add a few Easter touches there as well! 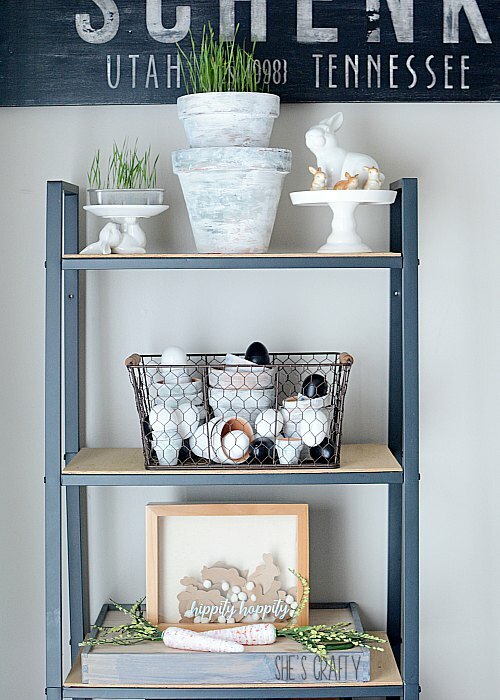 I painted a variety of clay pots (DIY instructions here) and planted wheat grass in a large one. I stacked a bunch of different sized pots in a basket with white plastic and chalkboard eggs. The bottom shelf displays my Easter Bunny shadow box. I think we are ready for our Easter meal! 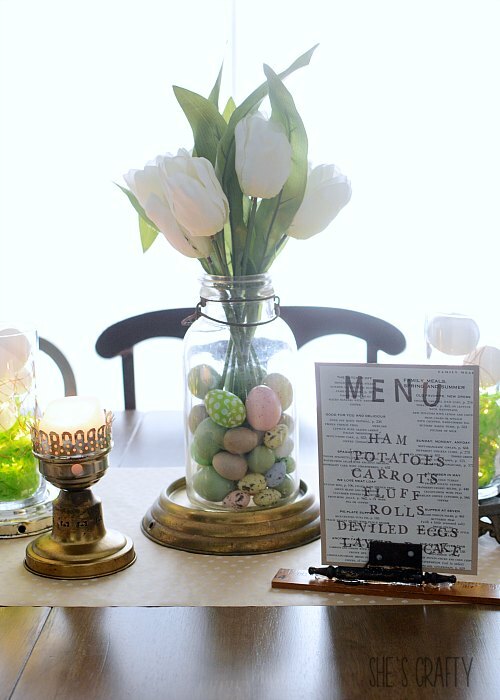 Do you have a traditional meal for Easter? Love this, Candice! 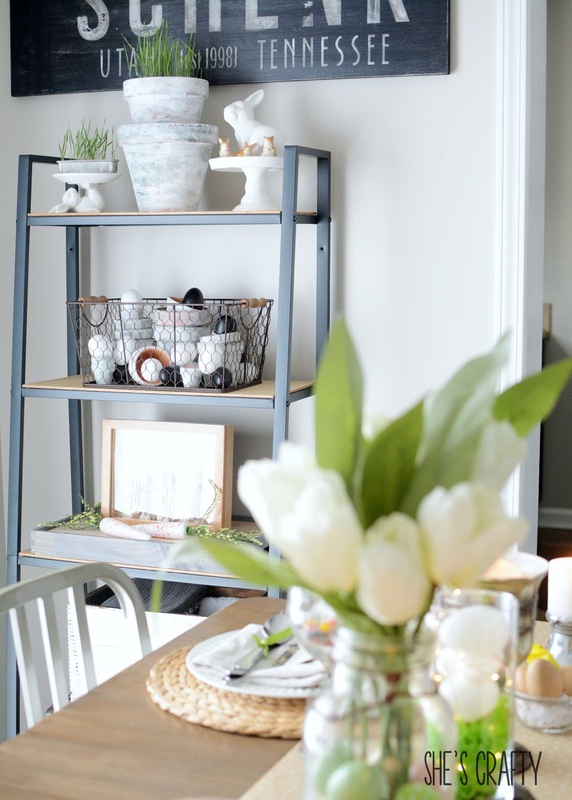 I especially love what you did with your shelving unit! This looks great! 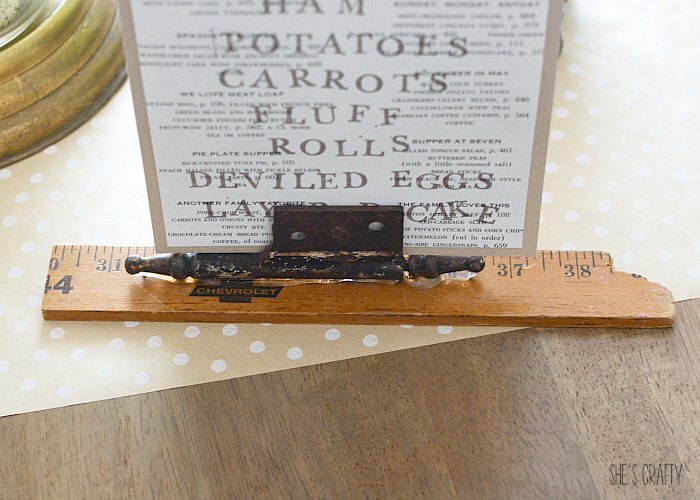 I love all of the vintage metal pieces - especially the hinges that are holding your place markers. Brilliant! I also adore those place markers and menu. Thanks for sharing at Sweet Inspiration! Thank you Amy! 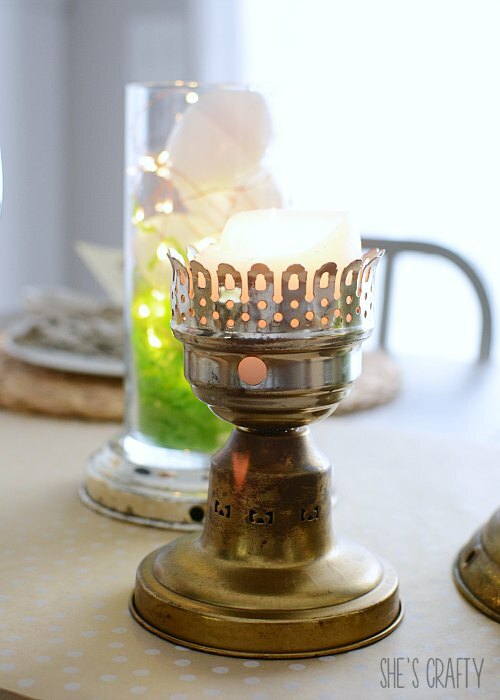 The vintage metal pieces were really fun to work with! So creative! Love the place card holder.